The purpose of this CD and the session is to train to easily refocus the mind to a much deeper level of inner awareness where remote viewing is natural and easy. The deep theta level. 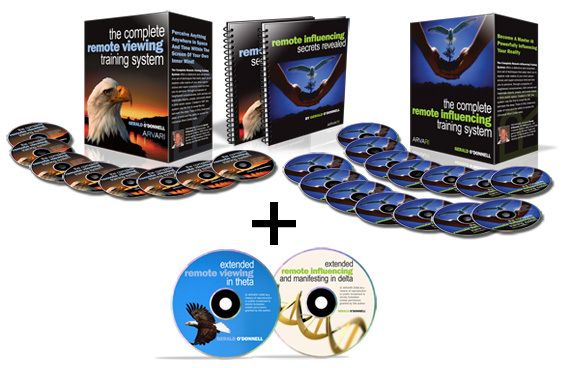 I bought the ARVARI remote viewing and remote influencing training system last December when Gerald O Donnell the creator of the course ran a holiday discount sale. Now, I have the the time to go through the course seriously and learn from it. 10 years ago, I did the RV course on audio cassette but now I’m doing it again with the addition of the RI course. I’m sure that the skill I’m relearning will help me in many areas of my life. I often have to deal with creative challenges and It is my belief that great artists, inventors, writers are channeling their creativity from their higher-self or even higher aspect of existence. This is a skill taught in that course. I enjoyed my session. Many exercises in that session reminded me techniques,I learned years ago in Silva Mind style-course such as breathing color, connecting with guide in alpha or deeper state, going deeper by visualizing myself descending in a elevator. I really like Gerald O Donnell style of relaxation exercises. When I reached the alpha state some explanation on how to reprogram the mind to manifest a preferred reality were given. Listening to that put me in a mild euphoria state as I clearly got the message. I’m following Gerald recommandation for combining both course the RV and RI. It does mean that for my next session, I will move on to CD 3. Do you have that course? What was your experience with it ?